Looking for discounts? Get free 1mg coupons and deals to save up to 75%. Click to activate the code and start saving now!!! Avail 50% discount on all Health Tests & Packages. This offer is valid in Delhi NCR, Hyderabad, Bengaluru & Pune. Don't miss out the offer while stock last. Hurry up!! Get flat 10% off on all Prescription Medicines & 10% on OTC products. This offer is valid in Delhi - NCR, Chennai, Agra, Indore, Hyderabad, Lucknow, Bhopal, Bengaluru, Jaipur, Kolkata & Ahmedabad. Now receive flat 50% discount on complete blood count test. It is valid in Delhi NCR, Hyderabad, Bengaluru & Pune. Hurry, this offer might end soon! Get flat 30% discount on comprehensive health check Up (includes 72 tests: Glucose, Liver, Kidney, Cholestrol, RBC's, Iron, Thyroid, Vitamin & more). Valid in Delhi NCR. Grab flat 20% discount on all prescription medicines and 15% off on OTC Products. The offers are applicable on all orders for medicines and other healthcare products on 1mg. The offers cannot be redeemed for cash or clubbed with any other offer or promotion. Max discount allowed ₹500. The offers are valid for a limited period only. The offers are available in Delhi - NCR, Chennai, Agra, Indore, Hyderabad, Lucknow, Bhopal, Bengaluru, Jaipur, Kolkata & Ahmedabad. Get flat 50% on Glucose - Fasting Blood Test. It is valid in Delhi NCR, Hyderabad, Bengaluru & Pune. Valid till 30 June 2016. Avail this offer before it overs. Take flat 50% on Comprehensive Health CheckUp (includes 72 tests: Glucose, Liver, Kidney, Cholestrol, RBC's, Iron, Thyroid, Vitamin & more). It is valid in Delhi NCR, Hyderabad, Bengaluru & Pune. Get flat 50% on Thyroid Profile Total Test. It valid in Delhi NCR, Hyderabad, Bengaluru & Pune. Don't miss out the offer while stock last. Hurry up!! Grab flat 50% off on Whole Body CheckUp (includes 101 Tests). It is valid in Delhi NCR, Hyderabad, Bengaluru & Pune. Get flat 50% on Pro Aarogyam 1.2 (includes 64 Tests). It is valid in Delhi NCR, Hyderabad, Bengaluru & Pune. Don't miss out the offer while stock last. Hurry up!! Now get flat 15% discount on all prescription medicines and OTC products. Minimum spend should be ₹500 to avail this offer. Make use of this limited time offer and get flat 20% discount on all prescription medicines and 15% discount on OTC products. Offer is valid on minimum spend of ₹1000. Now get flat 10% discount on all prescription medicines and OTC products. Simply apply the given code to grab this offer. No minimum spend required. Get flat 50% discount on all lab tests & health packages by using coupon code. No minimum order value required. Get flat 15% discount on Dettol liquid by using the voucher code. Grab this coupon now! Shop and get 25% discount on all prescription medicines and 15% discount on OTC products. Grab a flat 20% discount on all Prescription medicines and 15% discount on OTC products. Grab flat 50% off on all lab tests & packages in Delhi/NCR, Banglore & Hyderabad. Use coupon code to avail this offer. Flat 50% discount on Pro Aarogyam 1.2 (includes 64 Tests). Valid in Delhi NCR, Hyderabad, Bengaluru & Pune. Get flat 50% discount on comprehensive health checkup (includes 72 tests: Glucose, Liver, Kidney, Cholestrol, RBC's, Iron, Thyroid, Vitamin & more.). Valid in Delhi NCR, Hyderabad, Bengaluru & Pune. Valid till 30th April 2016. Get flat 10% off on all medical tests & health packages. Valid in PAN India. Use voucher code and get flat 15% off on Moov. Valid for a limited period only. Flat 15% off on Dabur Chyawanprasy at 1mg. Offer valid till 30th April 2016. Grab flat 15% discount on mammy poko pants from 1mg. Shop now! Shop at 1mg and avail 15% discount on Horlicks chocho flavor. Use voucher code at checkout. Grab flat 15% discount on Johnson baby cream available for 1mg, get it now! Buy Volini spray online at 1mg and get discounts of flat 15%. Apply the given voucher code during checkout. Get wellness check up, whole body check up, blood tests, urine tests and many other tests at flat 50% discount. Grab flat 50% discount on thyroid profile total test. Valid in Delhi NCR, Hyderabad, Bengaluru & Pune. Valid till 30th April 2016. Get flat 50% discount on Glucose - Fasting Blood Test. Valid in Delhi NCR, Hyderabad, Bengaluru & Pune. Grab it now!! Flat 10% off on all prescription medicines & OTC products. The offers are applicable on all orders for medicines and other healthcare products on 1mg. 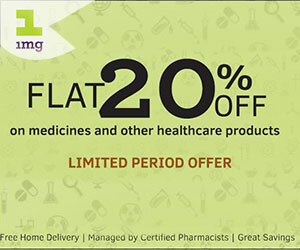 Flat 20% off on all Prescription Medicines & OTC products minimum purchase of Rs.1000. The offers are applicable on all orders for medicines and other healthcare products on 1mg. Hurry Up! Flat 15% off on all prescription medicines & OTC products. Applicable on minimum purchase of Rs.500. The offers cannot be redeemed for cash or clubbed with any other offer or promotion. Use voucher code and avail flat 20% discount on all products. Applicable on minimum purchase of Rs.1000. Maximum discount of Rs.500. Offer is valid for a limited period only. Shop at 1mg and avail 15% discount on medicines and other healthcare products. No minimum purchase is required. Use voucher code during checkout. Maximum discount is Rs.500 can be availed. Buy now! Use voucher code and grab flat Rs.100 discount on authentic ayurvedic and homeopathic medicine at 1mg. Applicable on orders above Rs.500. Order now! Use coupon to avail flat 25% discount on all medicines and healthcare products listed on 1mg with no minimum order value condition. The offer is valid only for a limited period. Get flat 15% off on purchase of health products and medicines only at 1mg. Use voucher code at checkout to redeem the discount. No minimum purchase required. Now feel lucky offer for all Hyderabad and Chennai customers on all medicines and OTC drugs. Get flat 25% off on all medicine orders and Over The Counter (OTC) drugs only at 1mg. No minimum order value required. Grab flat 10% discount on all prescription medicines and OTC products. Grab this offer now! Get flat 10% off on all lab tests and health packages. Use the voucher code at checkout to redeem the discount. Grab it now! Grab flat 20% discount on blood glucose metabolizer-34 (BGM-34) tablets. Apply the given voucher code at checkout to redeem the discount.